Since the fall of Jerusalem to Saladin in 1187, the Knights Templar had been in decline. They fought on through the crusades in the losing fight to keep Christian kings in the Holy Land. Their monastic headquarters stood at Acre and cities in the north for a century, but Moslem troops forced them off the mainland to Cyprus. The stronghold there fell in 1302 to the Mamluks, and the Templars had lost their mission. What to do with the Templars stood as the question of the day. Pope Clement V, newly appointed in 1305, offered the suggestion of merging the Knights Templar with the Knights Hospitaller, who were forming up a monastic state in Rhodes as the Teutonic Knights had in Prussia. Both Grand Masters of the two orders ultimately rejected the idea, but, while the discussions were carried out in France, the pope also discussed charges of heresy and corruption that had been brought against the Knights Templar. While questionable, the allegations stood, and the pope sent a letter to the French king Philip IV to investigate. Philip, who was gravely indebted to the Knights Templar in the funding for his wars against England and Flanders, saw this as an opportunity to eliminate the would-be bankers. On October 13, 1307, Philip gave the order to arrest dozens of top Templars, but Grand Master Jacques de Molay escaped secretly. Over the coming weeks, false confessions of idolatry and sinful rituals would be torn from the Templars under torture. 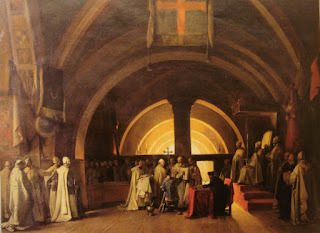 Philip pressured Clement V to give an order that the rest of the Templars be arrested and convicted; with the Order gone, Philip's debts would be struck out. However, the network of Grand Master de Molay enabled the Templar to gain the attention of the pope. Even as Clement had moved the papacy to France, the Templars could protect him from Philip's military, and what the Order needed was a new goal. After much discussion, it was decided that the Order would purify itself and begin a quest to establish an alliance with the Mongols (believed to be descended from influence from the mythical eastern Christian king Prester John). Clement V, much to the chagrin of Philip, gave the papal bull entitled Nova Templarae on November 22. The renewed Templar Order would soon announce a new crusade. In 1305, Oljeitu of the Ilkhanate in Persia had sent an embassy to Clement, Philip, and the English king Edward I to attempt a military alliance, but distractions in Europe had slowed plans. Now with the Templars freed by selling off their many monastic assets, including Philip's debt (which was purchased by Holy Roman Emperor Henry VII, giving a considerable boost to the political clout of the House of Luxembourg), the Templars began to piece together their Tenth Crusade. Consulting with the aged Crusader-historian Jean de Joinville as well as the famed merchant Marco Polo, whose book had described Prester John as the Mongol's foster father, the Templars set out exploring eastward on a northern route through the Black Sea and across Christian Armenia to begin contact. By 1312, the Tenth Crusade had been launched. Simultaneous attacks from Ilkhanate Mongols in the northeast with Crusaders backed by mercenaries from the Caucasus in the northwest pushed Mamluks back into Egypt. Within a generation, the Holy Land was in the hands of the Crusaders once again, and the remainder of Egypt was now a vassal to the Mongols. In the 1340s, however, the Black Plague broke out through the Middle East and spilled into Europe. The plague was taken as a sign of punishment for drafting an alliance with unchristian fellows. Breaking off relations with the east, Europe turned toward itself under the emboldened leadership of the Church, working to purge the ideas that past Crusaders had carried back with them and the dangerous readings of pagan science and literature from ancient Romans and Greeks. 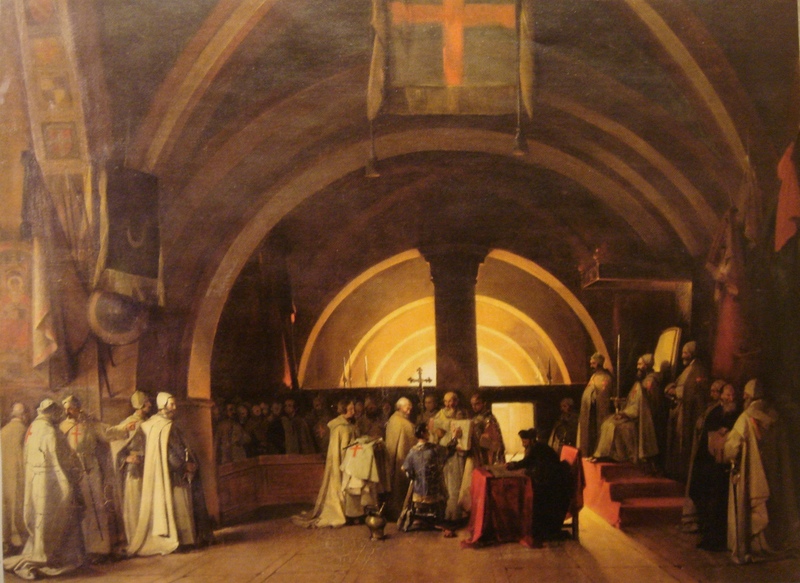 In the next century, a rebirth of allegiance to the Church would be conducted by Orders such as the Templars, still ruling out of Jerusalem until its fall to the Ottomans in 1467. Encouraged by trade and conquest, the Ottoman Empire launched its invasion of barbaric Italy in 1543 under Suleiman the Magnificent. Northern Europe would resist for centuries, holding back Muslim imperialism with renewed feudalism, despite the great militaristic might brought forward by Ottoman mastery of gunpowder and cannon. In reality, Grand Master de Molay was arrested as well, and the papal bull that November called for similar arrest and seizure of Templar assets from every monarch in Christendom. Many of the Templars disappeared, often cited as fleeing to Scotland or Switzerland. Europe did receive an embassy from the Mongols for an alliance in 1305, but few considered them a reasonable match. Philip IV and Clement V spearheaded calls for a new crusade, though both would die in a matter of months after the betrayal of the Templars, said to be from the curse spoken by de Molay as he was burned at the stake, “Dieu sait qui a tort et a pëché. Il va bientot arriver malheur à ceux qui nous ont condamnés à mort” (“God knows who wronged and sinned. He soon will arrive with misfortune at those which condemned us to death”).